Enterprise interest in software-defined WAN (SD-WAN) technology is blazing hot, with the technology enabling rapid evolution of legacy WANs and accommodating a cost-effective shift to cloud-based architectures by leveraging software-defined networking principles. Enterprises expect a huge uptick in service agility, an operational model that is extremely efficient and scalable, and bulletproof security that protects each application and its associated network resources. But with most SD-WAN vendors claiming to provide all the same benefits to prospective enterprise customers, marketplace confusion is no surprise. In many cases, the final decision comes down to price, with enterprises disregarding critical considerations that, when overlooked, can have dire consequences on SD-WAN success. In the end, many enterprises fail to take into account their ability to integrate and deploy the solution flexibly and efficiently into an existing WAN environment even though this should be an essential decision criterion. IT professionals responsible for transforming their company's WAN to SD-WAN technology should consider various deployment options to assure they take the right approach. For one, IT needs to take current and future cloud strategies into consideration. For example, in order to support a UC-as-a-service (UCaaS) migration, the SD-WAN needs to extend to and integrate with the UCaaS point of presence. IT might also need to consider an infrastructure-as-a-service (IaaS) model for applications the company wants to continue managing but may not have the resources with which to accommodate their growth. For all of these reasons, the SD-WAN solution needs the deployment flexibility to support multiple public clouds and a multi-cloud deployment model. 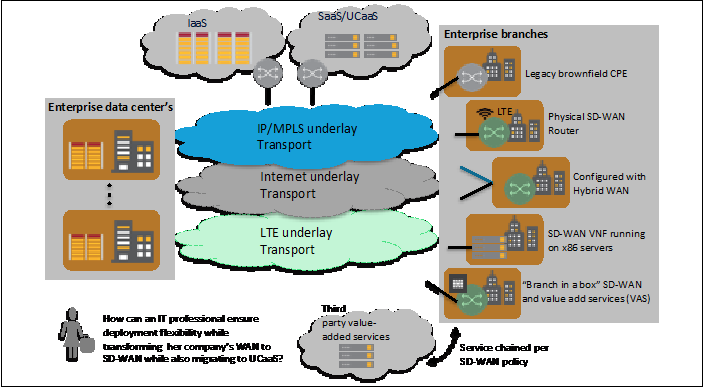 Disjointed transport -- Since some branches are not homogeneously connected by the underlay transport network, the SD-WAN solution will need to support a specialized routing capability that will seamlessly connect disjointed underlay transport segments. For example, several remote branches may only be connected by Internet transport, but will need to communicate to some branches that are only connected through IP/MPLS. After taking the time to thoroughly examine the different deployment criteria required for the company's SD-WAN implementation, the path forward for IT should become clearer. All enterprises must engage in this exercise before migrating to a cloud environment. An SD-WAN solution built with deployment flexibility and support for open standards will help unleash the power of the cloud. Learn more about SD-WAN at Enterprise Connect 2018, March 12 to 15, in Orlando, Fla. Register now using the code NOJITTER to save an additional $200 off the Early Bird Pricing, ending Friday, Feb. 16, or get a free Expo Plus pass.